New High Tech Innovation! This 100% clear cover blocks infrared cameras! Designed to defeat: Photo Radar, Red Light Cameras, Toll Road Cameras, Any camera type that uses infrared recording! Plate visible to the naked eye from any angle. What are infrared cameras? They use infrared (IR) flash and IR photography (Outside the visible spectrum, above 720 nm wavelength). Thus an IR Flash is normally not visible to the naked eye. A faint "Red Flash" is sometimes visible due to light spillover. Why are they used? Advantage of infrared flash is that it does not blind drivers at night like a normal flash could, when they aim for the driver's face & license plates. Since the flash can not be seen, cameras remain stealthy and ready to get you again the next time. Note: This product is NOT intended for use with regular visible light cameras. Buyer assumes all responsibility for using this product in compliance with local motor vehicle codes. Works exactly as described. I tested this product out using an IR camera and it becomes much more reflective as the angle increases to the point where its a mirror. The pictures aren't faked, that is really what this looks like in IR, but the human eye can't see any distortion. 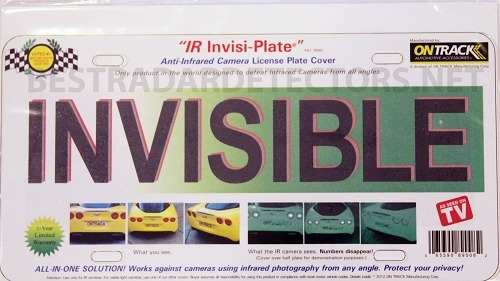 If you want protection from cameras that use IR then this is the plate cover for you; there is no unwanted attention which can come from the other covers.